"Cruden's Concordance to the Bible is four times the length of the Bible itself, and in nearly 300 years it has never been superseded. 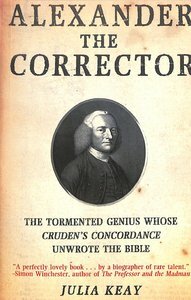 Yet Alexander Cruden is remembered today not so much for his mighty work as for the widespread belief that he was mad. About "Alexander the Corrector: The Tormented Genius Whose Cruden's Concordance Unwrote the Bible"